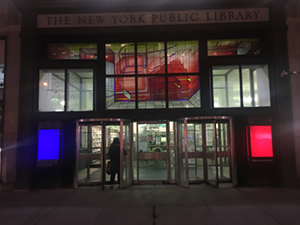 Mid-Manhattan Library Art in the Windows Exhibition-Ellen Hackl Fagan, What Does Blue Sound Like? 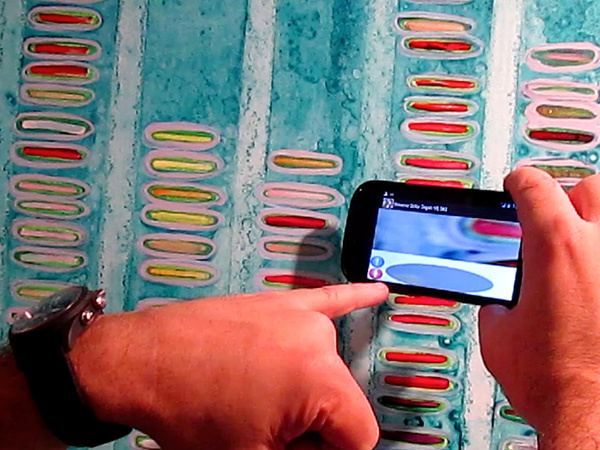 This exhibition features The Reverse Color Organ (RCO) with an interactive web app that viewers can download to their iPhones or Droids. Their phones become a synaesthetic tool, enabling them to explore their own unique opinions about the sounds of colors. Special event: Joseph Celli composer, radio producer and virtuoso on double reed; and Hap Tivey artist and an early pioneer in the California Light and Space movement; join Ellen Hackl Fagan for the Artist Dialogue Series event in the Corner Room of Mid-Manhattan Library on Saturday, April 29 at 2:30 PM. Initiated and organized by Arezoo Moseni in 2004, Artist Dialogue Series provide an open forum for understanding and appreciation of contemporary art. Artists are paired with critics, curators, gallerists, writers or other artists to converse about art and the potential of exploring new ideas. The event is free and advanced registration is recommended. Ellen Hackl Fagan is the inventor of The Reverse Color Organ (RCO) and the ColorSoundGrammar Game, two projects that enable viewers to interact aurally with color. 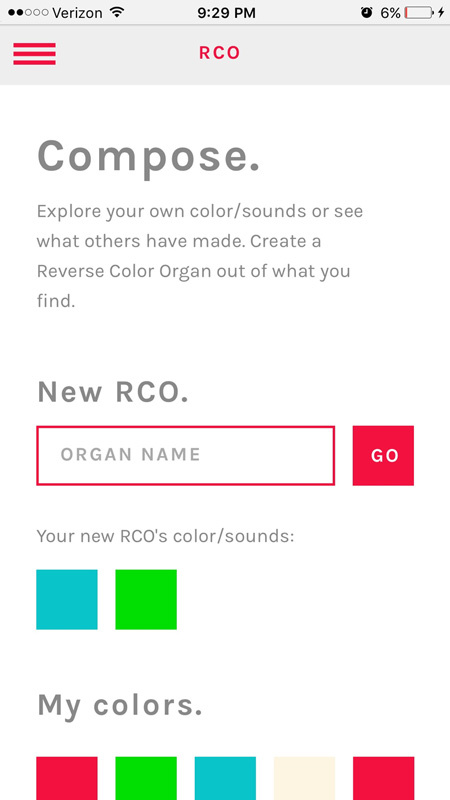 In collaboration with cognitive scientist Michael Cole and programmer Joshie Fishbein, the Reverse Color Organ is being developed into web based app which will place this synaesthetic tool into peoples’ hands to be used, not only to expand the language of color, but also as a crowd-sourced musical instrument. There will be an onsite installation in Ellen Fagan’s studio in the back of ODETTA, and along a length of fencing leading up to the Acropolis in Marcus Garvey Park for FLUX Fair. Creative Tech Week is the brainchild of Isabel Draves, the director of Leaders in Software & Art (LISA). Isabel envisions a future where New York City will be the center of the creative technology world, thereby offering artists more opportunities for collaboration and innovation as their artworks continue to utilize technology as a key component in the expression of their concepts. FLUX Art Fair is Director Leanne Stella’s newest creation. Having evolved from storefront gallery spaces to her second art fair, Leanne is innovating the way art fairs can take form. Fully supporting emerging talent, the outdoor public sculpture concept has helped connect selected artists to producers, developers, and galleries. With this first version of the RCO, viewers searched out the sonic responses to colors and details in selected paintings w/a mouse. This version was entirely on computers. The sonic palette was composed by Michael Feldman and was designed for each painting of Ellen's. The paintings were all created in 2004. Copyright © 2019 Ellen Hackl Fagan. All rights reserved.